Robinson Run had plenty of fresh snow and I didn't have any competition for first (or second, third...) tracks. I practiced the fine art of "spooning turns" to maximize runs through fresh powder. 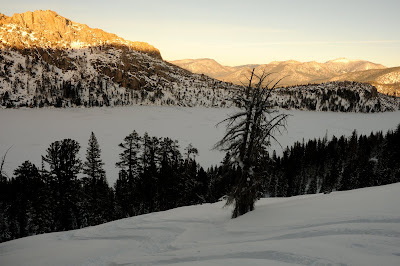 With the sun about to leave Flagpole Peak above Echo Lake, I had time for one more set of turns. And they were great.